Things on the bike: (front rack) 2 gallons/7.5 liters of interior house paint, a gym bag full of wet clothes, a canvas bag containing a couple books, 1.5L of red wine, and two tacos--1 fish; 1 tofu--from Cantina Loco. (rear carrier) a 5 1/2 foot/1.67 meter Christmas Tree. A synopsis of a brief conversation while purchasing the tree: The pleasant young woman at the cash register says to me as I pay her, "Would you like someone to carry that to your car?" I'm thinking to myself, I'm taller than this tree...I may be 50 now but I'm not that old; I'm assuming she was just offering good customer service. Anyway, I reply, "No thanks, and I'm carrying it on my bike not in a car." Blank stare, then "How are you going to do that?" "It's a big bike," I tell her, "built for carrying stuff," then add, "I've already got two gallons of paint on it out in the parking lot." More blank stare...looking at me to see if I was joking or not, then "I may be able to have the tree delivered if you'd like." "No," I replied, "thanks anyhow." Then I added, "And I don't mean to be rude, but you are getting the wrong impression. I own a car--a small pickup truck, actually--It's just that I choose to ride a bike whenever it's feasible and as often as possible." Another blank stare, and this time a much longer pause, then "Oh man, you're a crazy guy aren't you?" At this point I'm not really sure what she meant--if she was being sarcastic or meant it literally--either way it didn't bother me. She wished me a Merry Christmas as I slung the tree over my shoulder. After strapping it on the bike and as I coasted silently through the parking lot with the wind to my back I could feel that it had just started to snow a bit--little tiny flakes that you could only see under the street lamps--and I could feel them on my face. It felt good to be on a bike in the brisk weather after facing a stove all day, and it felt good to be on a bike while I passed cars in gridlock during rush our. It felt good to use my own energy for propulsion. I felt free, and I thought to myself that I likely am a little bit crazy...crazy for life. If you haven't seen the giant wreath I carried home on this bike and would like to, click here. 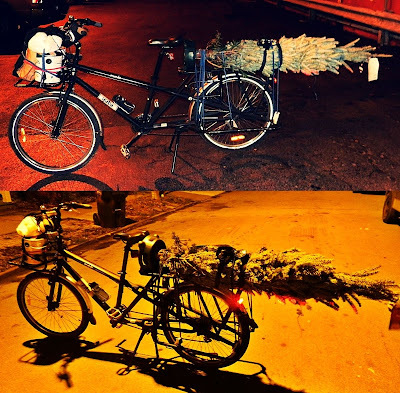 I remember when I got a tree with the Xtracycle, half the people working for the tree market came to watch us leave. Since then I was commisioned to make a 'christmas tree' from cardboard. It works remarkably well considering.